Pop Up Flea | The Lineup | A Continuous Lean. 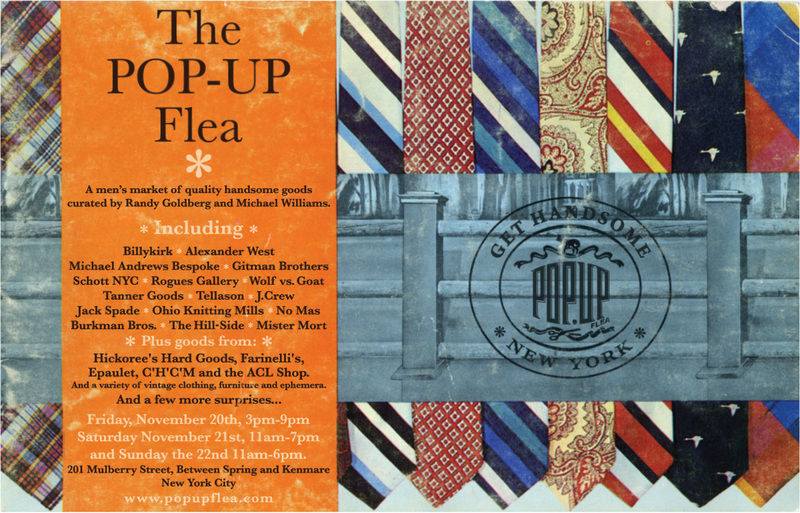 Announcing the lineup for the second ever Pop Up Flea. Everything kicks off this Friday afternoon at 3pm and runs throughout the weekend. The complete dates and times are below. See you there. Saturday November 21st, 11am-7pm and Sunday the 22nd 11am-6pm. If only I lived in NYC, seem like a really nice weekend! But I’ll have to stick to Copenhagen for now though. Just a minor blaze resulting from some negligent roofers… Under control now! I thought the fire was a joke! Remember, always call 911 to report an emergency, don’t leave it here in the comments! So these pop up fleas are cash only sales like any other flea market? I’m totally going to go but I don’t like to travel with so much pocket money. Look, I’ll just extend the invitation to bring this event as a travelling show to Melbourne… Australia, that is. What if I offer my study and an air mattress as accommodation? You rugged types are into camping, right? At the first, it was cash-only but with the convenience of an on-site ATM. This looks great — still can’t believe my good fortune finding Aprix there last time and getting it at a markdown price from the man himself. I am sure, like the first one, many of the vendors will be accepting credit card as well. We (Billykirk) did. this vendor list is solid as hell. looking forward to seeing hickorees in the flesh…love their site. CHCM is great too. luckily, i’ll be in nyc this weekend. what subway stop is this near? Props to Michael & Randy for doing an amazing job! Stopped by yesterday and the space was crowded with stylish guys checking out all the brands. It was excellently edited and I had a great time. Picked up a Hill-side chambray pocket square and blackwatch wax coated tie and a Rogues Gallery patchwork wool pillow. I drove in to town on Sunday just for this event and was very impressed! Also had the pleasure of meeting Michael and Randy on what was probably a pretty rare break. Grabbed a Tanner belt and ties from Epaulet, Alexander Olch and Hill-side. Great selections, even down to the Neil Young acoustic soundtrack. Looking forward to the next one! There were some really great vendors there. Makes me want to wear men’s shirts. Still, I’ll never understand why a bow tie is $120! There was a nice selection of vendors and I enjoyed meeting Michael and Randy. Tour the pop up flea to london!